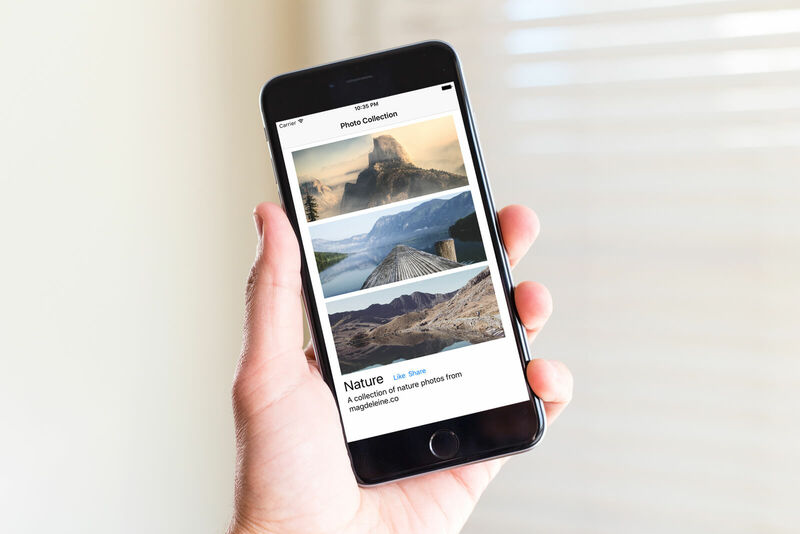 Display different images for different rows – lastly, we display the same thumbnail for all rows. Wouldn’t be better to show individual image for each recipe? Customize the table view cell – instead of using the default style of table view cell, we’ll take a look how to build our own. Before we move on to change the code, let’s revisit the code for displaying thumbnail in table row. 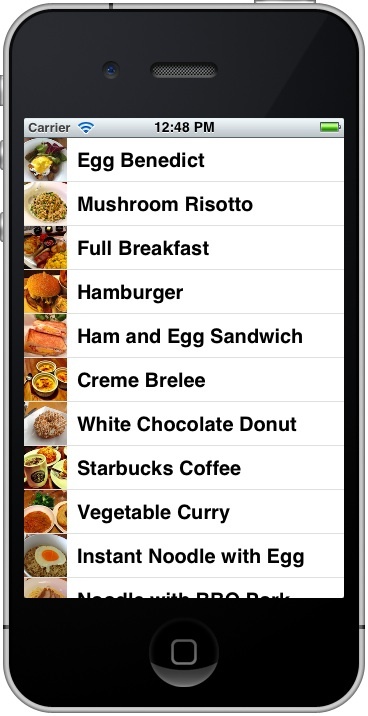 Lastly, we’ve added a line of code to instruct UITableView to display “creme_brelee.jpg” in each row. Obviously, in order to show different images, we need to alter this line of code. As explained before, the “cellForRowAtIndexPath” method is called by iOS automatically each time before a table row is displayed. If you look into the method parameter, it passes the “indexPath” when invoked. The indexPath parameter contains the row number (as well as the section number) of the table row. You can simply use “indexPath.row” property to find out which row it currently points to. Like an array, the count of table row starts from zero. In other words, “indexPath.row” property returns 0 for the first row of table. 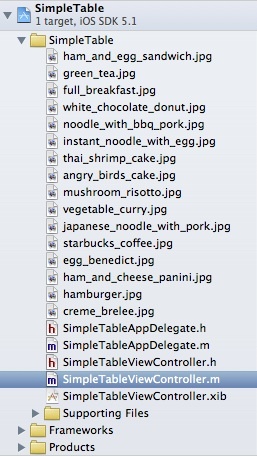 As you can see from the above code, we initialize the thumbnails array with a list of image file names. The order of images are aligned with that of the “tableData”. For your convenience, you can download this image pack and add them into your project. Make sure “Copy items into destination group’s folder” is enabled. The line of code retrieves the name of images for the specific row. Say, for the first row, indexPath.row property returns 0 and we picks the first image (i.e. egg_benedict.jpg) from the thumbnails array using the “objectAtIndex” method. Does the app look better? We’re going to make it even better by customizing the table cell. So far we utilize the default style of table view cell. The location and size of the thumbnail are fixed. What if you want to make the thumbnail bigger and show the preparation time for each recipe just like the below screen? In this case, you have to create and design your own table cell. Go back to Xcode. In Project Navigator, right click “SimpleTable” folder and select “New File…”. As we’re going to design our own table cell, we have to create a new Interface Builder file for the cell. For this case, we just need to start with an “Empty” user interface. Click “Next” to continue. When prompt to choose the device family, select “iPhone” and click “Next” to continue. Save the file as “SimpleTableCell”. Once the file is created, you should find it in Project Navigator. 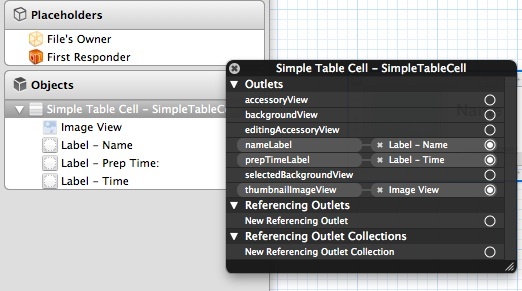 Select “SimpleTableCell.xib” to switch to Interface Builder. We’re going to design the look and feel of the custom table cell. 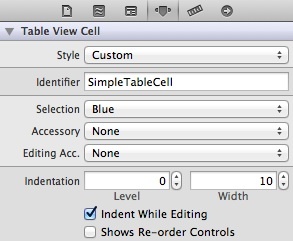 In the Object Library, select “Table View Cell” and drag it to the design area of the Interface Builder. In order to accommodate a larger thumbnail, we have to change the height of the cell. Just hold the lower/upper side of the cell and scale the height to 78. Alternatively, you can also use the “Size Inspector” to change the height. Next, select the “Attributes Inspector” in the upper part of the Utility area and set the “Identifier” of the custom cell to “SimpleTableCell”. This identifier will be used later in your code. After configuring the table cell view, we’ll put other elements inside it. 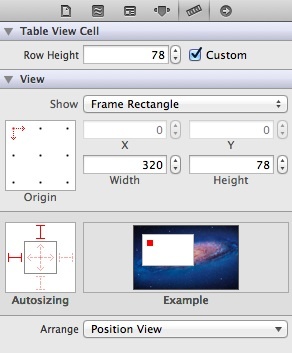 Select “Image View” and drag it into the Table View Cell. This image view will be used for displaying the thumbnail. You can resize it to make it fit the cell. For your reference, I set both the height and width to 69 pixels. Next, we’ll add three labels: Name, Prep Time and Time. The “Name” label will be used to display the name of recipe. The “Prep Time” is a static label that only displays the text of “Prep Time:”. 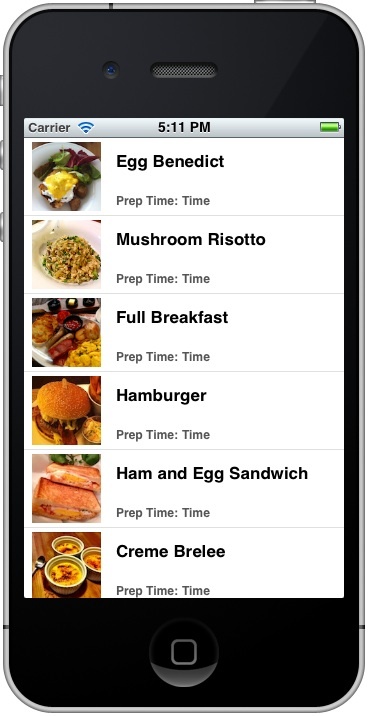 Lastly, the “Time” label is a dynamic label that is used to show the actual preparation time for the specific recipe. To add a label, select “Label” in Object library and drag it to cell. You can double click the label to change its name. You may notice your font size and style are different from the one shown above. 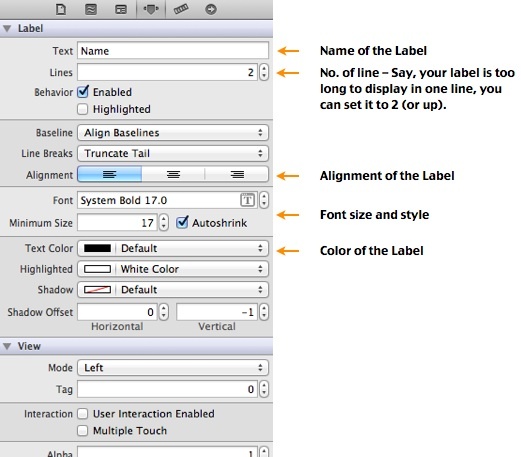 To change the font style, simply select the Label and select the “Attribute Inspector”. From here, you can alter the setting of “Font” and minimum font size. You can also change the text color and alignment through the inspector. So far, we’ve designed the table cell. But how can we change the label values of the custom cell? We’re going to create a new class for the custom table view cell. This class represents the underlying data model of the custom cell. Just like before, right click the “SimpleTable” folder in Project Navigator and select “New File…”. Right after selecting the option, Xcode prompts you to select a template. As we’re going to create a new class for the custom table view cell, select “Objective-C class” under “Cocoa Touch” and click “Next”. 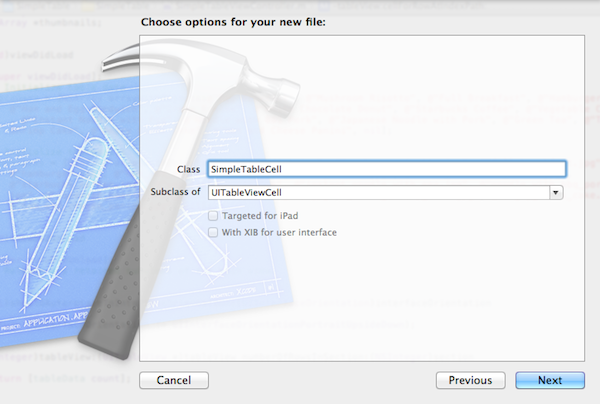 Fill in “SimpleTableCell” for the class name and select “UITableViewCell” for the “Subclass of” option. Click “Next”, save the file in the SimpleTable project folder and click “Create” to continue. 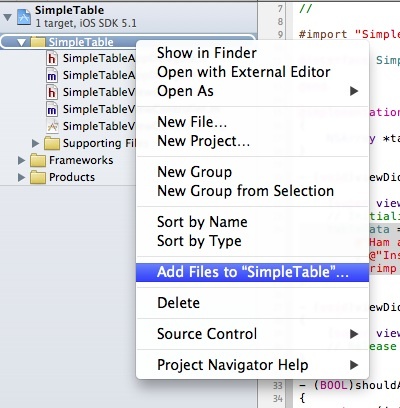 Xcode should create two files named “SimpleTableCell.h” and “SimpleTableCell.m” in the Project Navigator. As mentioned before, the SimpleTableCell class serves as the data model of custom cell. In the cell, we have three values that are changeable: the thumbnail image view, the name label and the time label. In the class, we’ll add three properties to represent these dynamic values. Referring to the lines of code above, weak and nonatomic are the attributes of the property. UILabel and UIImageView are the types, while the “nameLabel”, “prepTimeLabel” and “thumbnailImageView” are the names. So what’s IBOutlet? You can think of IBOutlet as an indicator. To associate the instances variables with the elements in the Table View Cell (i.e. SimpleTableCell.xib), we use the keyword “IBOutlet” to let Interface Builder know that they’re allowed to make connection. Later, you’ll see how to make a connection between these outlets and the objects in Interface Builder. 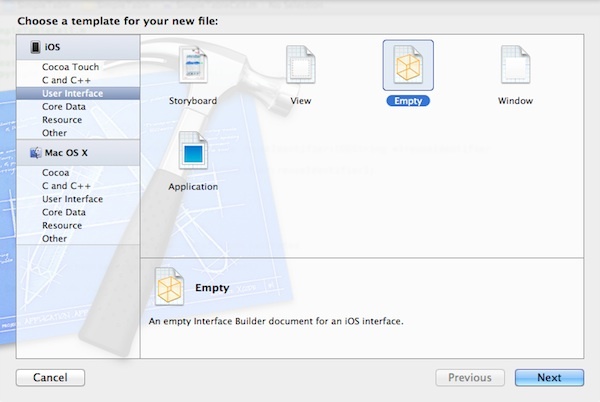 Save the changes and select “SimpleTableCell.xib” to go back to Interface Builder. Now we’ll make connections between the properties of the class and the Label/ImageView created in the Interface. First, select the cell and change the class to “SimpleTableCell” in “Identity Inspector”. This associates the cell view with our custom class created earlier. Now, we’ll establish the connections with the properties. Right click the “SimpleTableCell” under “Objects” to display the “Outlets” inspector. Click and hold the circle next to “nameLabel”, and drag it to the “Label – Name” object. Xcode automatically establishes the connection. We have completed the design and coding for the custom table cell. Finally we come to the last part of the change – to make use of the custom cell in the SimpleTableViewController. However, as soon as you update the code, Xcode detects there are some errors as indicated in the source code editor. What’s the problem? 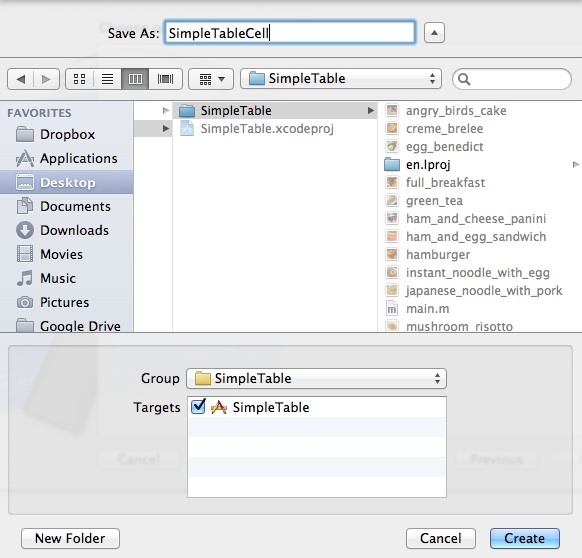 The code we’ve just changed tells “SimpleTableViewController” to use “SimpleTableCell” class as the table cell. However, “SimpleTableViewController” doesn’t have any idea about it. That’s why Xcode displays errors. 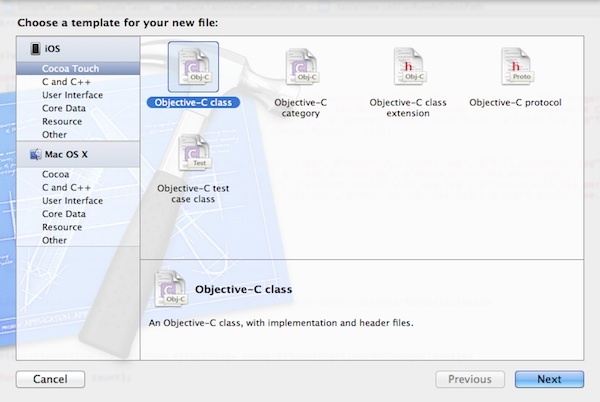 As explained in the first tutorial, a header file declares the interface of a class. For “SimpleTableViewController” to get to know “SimpleTableCell”, we have to import the “SimpleTableCell.h” in the “SimpleTableViewController.m”. By importing “SimpleTableCell.h”, the “SimpleTableViewController” knows what it is and can make use of it. Lastly, as the height of table cell is changed to 78, add the below code above “@end”. After working through this tutorial, you should have a better idea about UITableView and how you can create your own table cell. Next up, we’ll further talk about how to handle row selection. As always, I love to hear your feedback. Does the tutorial give you a better idea of iOS programming? Drop me comment below or head over to our forum to ask question. 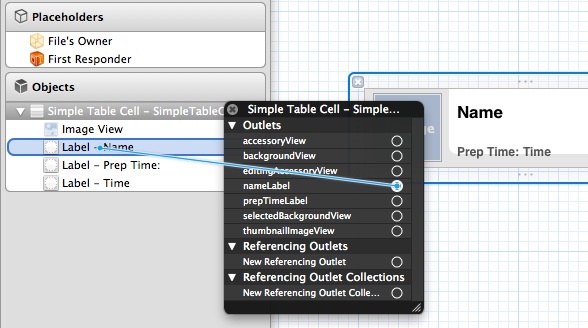 Update #1: Check out our new tutorial about how you can style the table view cells! Update #2: You can now download the full source code of the Xcode project. This tutorial was exactly what I needed, thank you! Is there an alternative to setting the row height in the last method in the tutorial, possibly in storyboard? I notice setting the cell height in storyboard doesn’t work. The same here. The height code just dosnt seem to fire. I have an alert box in the code to test, and have set break points, but still dose not fire. Fixed this. I had an error where my on the SimpleTableViewController.xib the view under “objects” needs to be set as the file owner (right click view under objects, under ref outlets drag up to File’s Owner , on the popup click view. This solved it for me. Just finished the tutorial last night, If you don’t do the array for the Times, the code does not run anyway. You forgot to set the custom class for SimpleTableCell.XIB >> SimpleTableCell. It’s mandatory. The set of Identifier it’s not necessary. Without these the IBOUTLETs is not possible. Hey there. Kudos on the great tutorial. I’m just having some issues. I followed this tut step by step, and I even added the prepTimes array for use. But when I run it in the iOS Simulator, all I get is a black screen. Any ideas why? We done for this nice tuto! In the line cell.prepTimeLabel.text = [prepTime objectAtIndex:indexPath.row]; I get the error message Use of UnDeclared identifier PrepTime. Any idea how to resolve this? This is great content, which helped me. not sure I missed text but . Before doing “Next, select the “Attributes Inspector” in the upper part of the Utility area and set the “Identifier” ” don’t we set custom class-> class selection to “SimpleTableCell”? I can see nameLabel and other outlet after changing that. Thanks for great content. I defined PrepTime as an NSArray and simply added elements to this array like the other two arrays. When I run, now I get a different kind of ‘green’ message after the welcome screen in the code. This occurs in the line cell.prepTimeLabel.text. @Krishna, in Objective C (and most of the programming languages), the syntax is case sensitive. 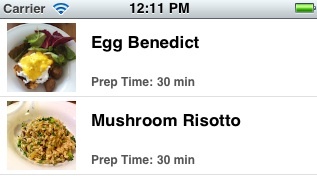 So “PrepTime” and “prepTime” are two different variables. Please check your code again and make sure you declared “prepTime” instead of “PrepTime”. @Krishna, can you open a new thread in our forum and show me your code? me too getting the same error as Krishna…. I had the same problem. You don’t need the prepTimeLabel code. It is static so it doesn’t need to be in there. Thank you so much. These tutorials are really well made and extremely helpful. It will be great if you could introduce new topics more frequently (without so much gap in between). I’m trying my best to publish more frequently. Stay tuned. Thanks. Really great to hear that! Awesome tutorial, one of the best and in-depth I’ve found thus far! Thanks so much for taking the time to do this! That was the best tutorial about tableview EVER!!!!!!! Thanks!!! I see why he didn’t mention the prepTime array, but if you follow the suggested code to the end you’ll get a failed build. I think it’s fantastic to include the exercise, but it’s frustrating to start from a broken build. This is the Error I got.. Thanks for tutorial very much! BUT when i try app on device and scroll my app up and down the cells change form, become unpressable and look awful!! what to do? And can you please a tutorial for making a detailed view for each screen. Just finished my homework !! The tutorials are great!! I´m waiting now for the next tutorial !! 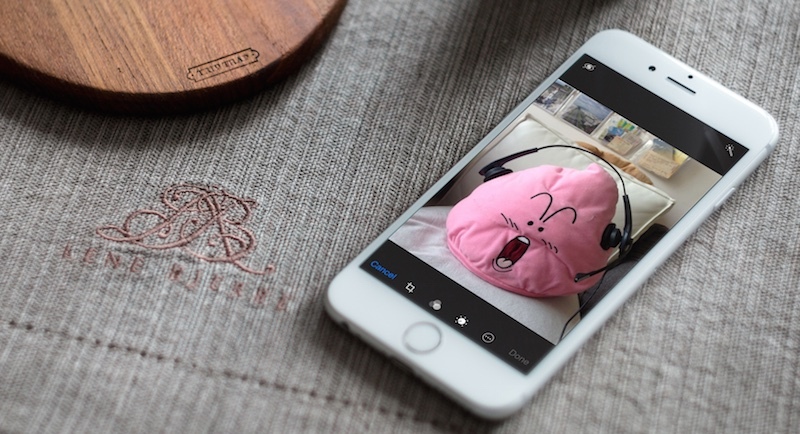 Maybe we could explore more on how to personalize the app…background images, colors,…. I can’t figure out the homework. Im stuck. Someone PLEASE HELP!! i think using a plist is a great way to load data, but the way the plist is set up, each index row of the array needs to correspond with the index row of another array… Why not make each item an object with properties of name, image, preptime and then call those? (SOMEHOW) that is what I would like to see.. That way if Eggs Benedict goes away, you can delete the object and not each key in each array? I tried to keep thing simple for this tutorial. Those who just start learning iOS programming may not have the OOP concept. But thanks for your suggestion! That’s a much better design. In upcoming tutorials, I’ll cover OOP and further improve the plist implementation. *edit: nevermind I found the solution myself. Due to the custom variances I made myself while following this tutorial I was declaring something wrong. This is the best tutorial in UITableView Cell customization. It is simple and beneficial. I made my now custom cell perfectly with 2 labels. The second label has a detailed text varies from one line to 30 lines. When i ran the application, the text of one cel overlay on the next cel. I’m having some problems, I have the exact same code as you do, but my final result is quite different, check it out. I don’t know what could be the problem, but any help would be appreciated. “method. Check it out again! Let me know if you still have the problem. I am lost here on photo attached. I have been trying to find the reason that I can not make the connection to the SimpleTableCell.xib. I’ve got this problem, too. Does anyone know the reason? I am using xcode4.5. Great tutorial, the explanations are very clear. Sir,actually the problem is….in your tutorial after selecting an item from the table view,then it navigates to another view controller containg a label.But my doubt is……..if the seccond view controller contains another tableview in which we use the concept of customization of table cell…..then how to pass data to that customized cell inside dat seccond tableview………. I just read this tut, realised the app, and it’s great ! Well, you’ll have that issue, because that is your homework… ^^ See at the end of that tutorial. simon sir please help me!!! What is your problem? Your only have to double click the code in the tutorial and press cmd + c and then cmd + v where your would like to have the code. Nice Tutorials and very very useful to us. the size of all images is not same so there is unpredictable output..
Got the homework figured out!! If I’m understanding this correctly, this means either I haven’t defined the User Interface label correctly, the UILabel is not delegated to an item on the xib, or I haven’t included the header file for simpletablecell.h. I’m pretty sure I have followed all your directions. // Created by Kevin Terusaki on 8/28/12. // Copyright (c) 2012 TeamAqua. All rights reserved. //Do any additional setup after loading the view, typically from a nib. I have no idea why this is occurring and have spent the last hour trying to figure it out. Any ideas? Great tutorial, the images with every step were very helpful! How do I configure a table view with this table view cell, using storyboard? But how can i make segue to show_item_detail_screen from a list with custom defined cells? Great tutorial, but i keep getting a sigabrt error. Even after hours of searching, still no luck. nice1..dude! really u must write more often! so that novice user like me,can get advantage from that! You forgot to mention that before making connection you have to set the class of File Owner to SimpleTableCel, otherwise connections cannot be made. When is the next tutorial available? Thanks for these great tutorials. I have a question since I have just started learning based on XCode 4.5.1 and iOS 6. Everything in this tutorial works great except that the final part in which we specify the heightForRowAtIndexPath method does not seem to work. In fact, I changed the the return value to an NSString expecting it throw errors, but no problem occured, which makes me think that the method is never called. I found the “Row Height” Property in the xib file for the SimpleTableViewController, which rightly sets the height to a specific value. That being said, has iOS6 gotten rid of the ability to create a row height based on a function? The reference in http://developer.apple.com/library/ios/#documentation/uikit/reference/UITableViewDelegate_Protocol/Reference/Reference.html makes me think that it’s still available, but they do mention “performance implications to using tableView:heightForRowAtIndexPath: instead of the rowHeight property”. Is there a step that I missed that made my SimpleTableView unable to have a row-height-setting method? Any thoughts would be helpful. It’s late for you but maybe someone review your questions. 1/ Click on the SimpleTableViewController.xib file. The screen with table appear. 2/ Click on the table. The properties area appear in the right side. Run the app again you will have the row size as expected. The problem annoyed me from yesterday. I checked my code repeatedly, but couldn’t find the answer. Here it is ! Haha. Thx for the tutorial !!!! Just what I was looking !!! Hello. I think your tutorial is just wonderful. I do have a question, though. I have tried just every combination I can think of to get this part of your tutorial to work below without any luck. Do you have a screen shot of what to do here? I’m not sure if I change the entire line, just part of it, etc…just not clear here although I’ve tried to figure it out. Thanks! Hi, could you pls give an example for 2 prototype cells (and 2 cell classes) on the same tableview? Very well done and very useful for an iOS newbie like me. Many thanks!!! Hi, I am able to establish connection with properties. No properties displayed when I right click the labels. What will be the problem. I am using Xcode4.5. I’ve attached a screenshot. Hi, I am not able to establish connection with properties. No properties displayed when I right click the labels. What will be the problem. I am using Xcode4.5. 2. In placeholder: select File’s Owner. 3. In the third thumbnail:”Identity Inspector” of the right panel, edit the “Custom Class” field and enter the name of your class. 1. Click the root view under Objects. 2. Click the last tab: “Show Connections”. 3. Drag “New referencing outlet” to “File’s Owner” and select “view”. In the XIB file which you created in the tutorial, select the entire Cell and in the Inspector under Identifier, type in the custom table cell name. See image below. If what i suggested does not make sense, review the entire tutorial. Eventually you will make mistakes and learn from them. The whole fun and point of programming. Great tutorial! I’m struggling with the very last part about setting the row height. I’m running Xcode 4.5.2 with iOS 6 and it seems to ignore it completely. Is there an alternative to using heightForRowAtIndexPath? I got it successfully implemented. however, the navigation doesn’t work anymore when I click on any cell. Previously when I clicked on any cell it will go to RecipeDetailViewController, which only show the name of the receipt. same problem, did you manage to get it fixed? Hi, how can I create a new cell that link to another viewcontroller? For example, the last cell about the Author, or Help or Feedback, which doesn’t have image, subtitle, etc. And it will link to another interface (different layout page/view controller). I tried by create in Storyboard but it didn’t show up. In other words, most cell created by code, but one or some cells created by storyboard? in SimpleTableViewController.m, the navigation is no longer working. 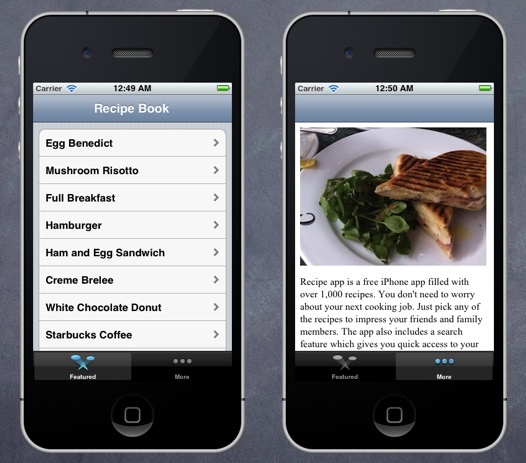 Meaning when u click on a cell, it will bring you to next page, which is just to display the recipe name. But now, it won’t go to next page. Because the Xcode now uses storyboards, it wont work because now, we use storyboards. In order to fix the problem, you have to create your table cell in the storyboard. Copy and paste the contents in the simpletablecell xib onto the prototype cell in storyboard. with “cell = [[SimpleTableCell alloc] initWithStyle:UITableViewCellStyleDefault reuseIdentifier:simpleTableIdentifier];” Remember to set the identifier of the prototype cell in the storyboard and hook up everything also. Hi , our case same. I replace the below statement. Work fine. Awesome tutorial, this post is very helpful to me Thanks so much ! very nice tutorial. Very useful site for iOS programming learners. Awesome! Simple, concise and only essential. I have wasted time with other tutorials until I came up with this one. Thanks a lot – good job! Wonderful tutorial, really enjoyed the step-by-step process. Are you going to do one for dynamic cells that the user can create? How i can pass data with seque and a custom cell. doesn’t work yet. Fantastic tutorial, This is what I was looking for. when i run the app no images are showing on the left. Thanks for the tutorial. Works like a charm. XCode 4.5.2. I think there is no big diferences but for people who is more comfortable on languages like java its simpler plus its less code. Great series of turtorials by the way. This helped a lot. Thanks soo much. Adjusted the custom cell view as mentioned, but my table view looks weird. I have the same problem. According to a comment I read, it might have to do with xcode 4.5 not using the method for the height the same way as it used to. Anyway, I’d like to have some feedback too. Return to the “Designing the Cell” part of the tutorial. I figured it out!!! You have to go into the other xib (SimpleTableViewController.xib) and change the row height in the size inspector. That overrides any setting you put in SimpleTableCell.xib How everyone else got away with not doing that I have no idea. Fantastic tutorial !! You made it really simple. Thanks for your words! I’m so glad to hear the tutorial helps you create your apps. I finally solved this. In the XIB file and set the File’s Owners class to NSObject. Then set the table cell’s class to SimpleTableCell and set the Identifier to SimpleTableCell then drag from the table cell to the labels and image and set them to the proper names. I am new to iphone programming and i am also getting sigabrt signal error even though i connected the controlls in xib files any solution regading this would be highly appreciated. best post about Table View! Awesome! Done and did the homework too 😀 Thanks so much. I had some problems and then did what everyone should do when learning. Erased everything and started from the beginning! I found my mistake and fixed what I had already learned. GREAT TUTORIAL! Works Perfect on iMac 2013/1 , Last available xCode 4.6.1. Thanks lot for great tutorial 🙂 I’ve gone through all your steps and when i press on run button then it runs smoothy 🙂 Home work is also done 🙂 I just love your tutorials 🙂 Thank you very much posting such a nice tutorial. I am getting an error on the nib of SimpleTableCell, any suggestions? My image didn’t load, so I have to copy the text. I am slowly learning how the debugger works. what does “this class is not key value coding-compliant” mean? But I have issue when display item. That’s the name does not display right place. I only saw the name with the prepTime when I click on an item. Please see picture for details. cell.textLabel.text = [tableData objectAtIndex:indexPath.row]; —> It seem for the whole item. You’re awesome! These tutorials help me get up and running very quickly! Love the little explanations in yellow like “Property and Outlet” and of course the images that describe what you’re talking about. Very nice tutorials. Thanks so much. So for me the custom format only shows when I click on the cells. I.e. scrolling through the cells look like the original, default ones, but clicking on them makes the name and prep time show. Any ideas on why this is happening? Hi, I seem to have a problem with the program. I would like it if someone can help me figure the problem. Thanks for the tutorial. It was really great. I am not able to run the app. It throws an error. Please help me. Mark, I executed the tutorial a second time with no success however I did notice this link for a TUTORIAL UPDATE which utilizes an alternate method. This way you can move forward and revisit this issue later as needed. I have the same issue, how could you fix it? ” on SimpleTableView.m file. You will again declaration SimpleTableView interface and it hasn’t tableData defination. Can the same result also be achieved when using storyboards instead of nibs? I am currently stuck at the “Making the connection” stage. After creating the .h and .m files and inserting the code lines. I am unable to see the Outlets when right-clicking on the Objects in the interface builder. Any ideas what it could be? I have deleted the files and re-created but I still come up with nothing on Outlets right-click menu. you must select the Table view cell in “SimpleTableCell.xib” and change the class to “SimpleTableCell” (identity inspector) and the identifier also to “SimpleTableCell” (attributes inspector) ! I’m having the same issue. It won’t allow me to change the class to SimpleTableCell. Just keeps changing it back to UITableViewCell. I don’t have it available in the pulldown like the downloaded code does. hi im emma! i have kinda the same problem u see. im not getting the oultet option. i tried what u said earlier to imran but that didnt work for me. please help as im stuch here. it says that ‘SimpleTableViewController’ cannot use ‘super’ because its a “root class. Hi. When i try to make connection in xib file between the table view cell and the class “simpletabcell”, the custom class show only the uitablecell. Can you help me? I follow all your instruction but i can’t make this connection. This is a great tutorial that i’d ever seen. Thanks you very much for the clear and neat explanation…. Hi I am wonder where “cell” is being defined. Hey man. I gotta say, these tutorials are awesome. Thank you so much for this. You sir, deserve an award. GREAT Tutorial! Thank you so much for posting this!!! The images so nice & made me hungry 🙂 Simple & easy to understand. Great tutorial. Thank you so much. Your tutorials are phenomenal. Thank you so much for spreading your knowledge and making this a fun experience! First of thanks for this great tutorial. I am totally new in Objective C and IOS programming. In this tutorial I am facing a problem while trying to connect the outlets to the UI components placed inside the SimpleTableCell. The IBOutlet entries declared in the SimpleTableCell.h are not appearing when i right click on the Table View Cell UI component in the object pane. I am using Xcode 5. I faced the same issue. You have to select the Table view cell. Go to Identity Inspector and change the custom class to SimpleTableCell. After that, when you right click, you will find the properties added to the list. Thanks a lot Manju. It solved the problem. Hi, I am new to Objective C & got the same problem as you. Change the Custom Class works for me. Please try this out. Great tuturials, I’m doing them all. And what about landscape, It probbably will not fit. If I set simpleTableIdentifier’s value to anything,it still does work,and it looks like it does not matter what custom cell indentified. I am currently trying this out Xcode 5 after following the previous tutorial that has been updated. anyway, the line with tableData and the line with prepTime both give me the error saying “use of undeclared identifier prepTime” and the same for tableData. What am I missing? thanks! PS. I love these tutorials! Very useful! this means “go to the NSArray recipes, find section identified by indexPath.row and pass its contents to cell.nameLabel.text. I really don’t know how it’s supposed to work with tableData. If somebody can explain this – I would be very grateful, I think I’m missing something here. This will display “30 min” for every cell. cell.imageView.image = [UIImage imageNamed:[thumbnails objectAtIndex:indexPath.row]];but every time i change it I just keep getting and error saying the thumbnails is wrong. I don’t know how to fix this or if I need a different code for Xcode 5. Very Nice and step by step tutorial.. owsm….. It said “Use of undeclared identifier ‘prepTime’ !!! I’ve followed every single step! And Im’m using the newest version of xcode. I don’t manage to scroll down to the last row anymore. I tried changing the height of the frame, but the problems stays until the rows are small enough to hold in one screen without scrolling. Is there a way to fix this issue ? I have got the same problem. Any idea how to fix it? For those of you who plan on working on this tutorial in the future and run into this issue as I did, the solution is simply that, by default, the iPhone simulator is for 3.5 inch iPhones, but the view is usually for a 4-inch iPhone. Running this tutorial in a 4″ simulator will let you get to the last row – conversely, you can shrink it to a height of 460px (leaving 20px at the top for the status bar), and run it in a 3.5″ simulator and it will display as expected. Then you’ll have to worry about autoresizing if you plan on supporting both phone versions, of course! I can make the connections with the Labels but not with the UiImage, dont know why…….I tried to delete the project, begin again from the beggining, but still the same…… Anybody knows why?? I am using Xcode 5.1 with SDK 7.1…. i couldnt establish relation with the properties !. when i right clicked the objects i didnt get the option of outlets what am i supposed to do now.? i really want to learn programming. I am doing something wrong. Everything works, except the cell spacing is completely off. Any ideas what step I may have missed? My labels don’t auto-resize to fit the content. Did I miss anything? I’m using Xcode 5.1.1 and SDK 7.0. I have the same issue. Any idea to fix? You changed the array from recipes to tableData but you didn’t add in code to fix up the instances of recipes. I think you should modify the arrays in the @implementation bracket. And replace the tableData by recipes. I think the modification of the arrays @implementation bracket has been forgotten. And the tableData should replaced by the recipes. So I’ve completed this tutorial and in update #1 it further helps customize the table cells by adding table cell background image. However it doesn’t show you how to do that if you made your custom table view cell through an empty interface like we did in this tutorial. Can someone please tell me how to add my own table cell background image to my cells if I created my cell through an empty interface like in this tutorial. thanks! Thanks for the update. Great tutorials! It works great. By the way, is it true that Purgatory Mountain, the one found in http://bit.ly/1jifRpt, is defeating this last month? kindly explain why 0 ? You have created an array with only one object and the easiest way to grab a single object from an array is to grab the first object (which will be at index 0). Objects in an array are ordered 0, 1, 2, 3, 4 – they start from 0 not 1. Please help me! Thank a lot! I receive an error stating “Use of undeclared identifier ‘prepTime’, however, I’ve checked in SimpleTableCell.m to make sure I typed the information in correctly there and I did. All seems correct everywhere else. What do I need to do to remove this error? hello sir, i have done table view tuto in xcode 5 from the link ” http://104.131.120.244/uitableview-tutorial-storyboard-xcode5/ ” and it ran successfully, but this tutorial has been done in xib, i am totally new to ios so can you please help me to do in storyboard..
Hi i am new in ios and nice tutorial helps me a lot!!! I need to display list of contents with image when i click each cells in tableview.. How to proceed..
Hi! It looks like great tutorial! Does it work with Xcode 7? Thanks for this best tutorial. For me it’s all working fine except spacing. I changed the height of the cell in xib file and in .m file also. But it’s not reflecting. What could be the reason. hey how to connect database with the application? how can we get the data from the database? 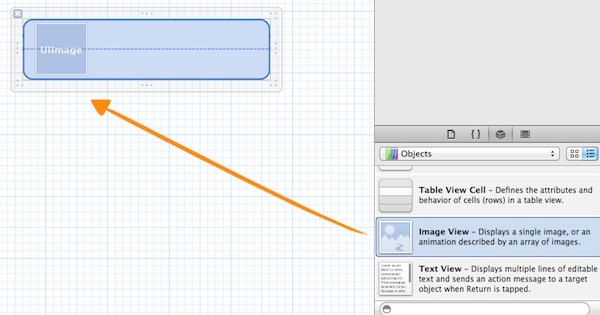 Hi all, can u Suggest me if is there is any possibilities to reordering/ copy/paste the TableviewCell from one tableView to another on a same XIB or Storyboard. hence I’m new to iOS please help me in this case..! Can Anyone help me in this Case please…? but then I turn it into comment, there is no error, but my application crash when i run the app . But it is available in source code file. U have any post related to data loading from service in Custom way like that u have done above?